Croisette Café, Bangsar: The French Connection in Kuala Lumpur! My Tête-à-Tête with a French Bistro serving French Comforts! Little did I know that there is a bewitching French bistro serving French comfort food in the bustling city of Kuala Lumpur! 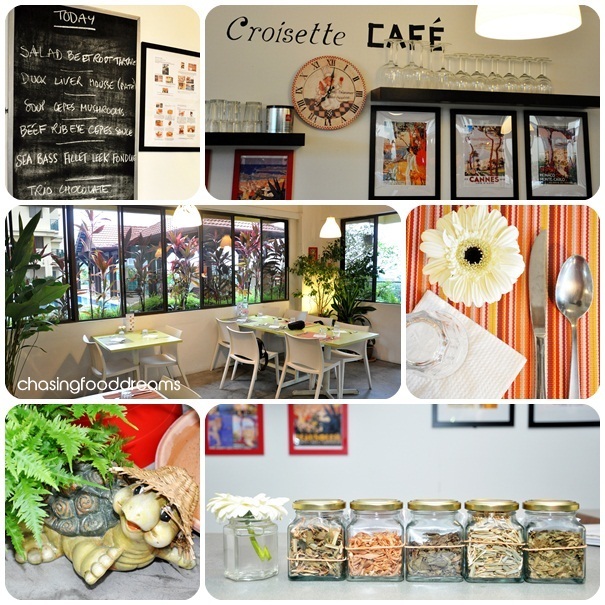 I first notice Croisette Café through Yin Yin and was immediately attracted by its quaint and Parisian offerings. Despite meaning to seek out Croisette Café since last year, it was only recently that I managed to visit the French bistro located in Cascadium Condominium in Bangsar. 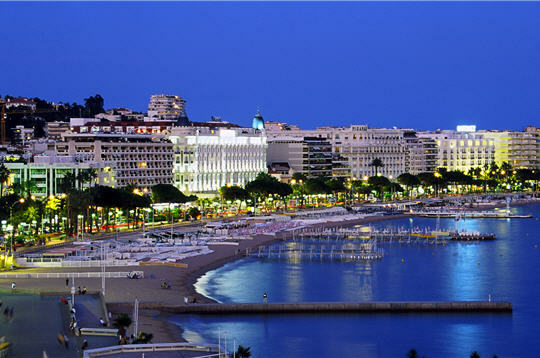 Named after the infamous Promenade de la Croisette in Cannes, France, where the famous Cannes Film Festival is held every year, Croisette Café is run by husband and wife team, Chef Pierre-M. Chaillou and Michelle. One actually has to enter the Cascadium Condo to park with a minimal parking fee and head towards the condo’s pool area to locate Croisette Café. Upon entering the bistro, I was amazed at the charm of the café with minimal décor but exuded warm comfort… the feeling you get when you enter someone’s home that greets you like an old friend! I met up with Michelle, who greeted with a sweet smile at first sight, and swiftly showed me to a table. We chat a little about Croisette Café and found that the kitchen is helmed by Chef Pierre alone with minimum kitchen helpers. The French chef prefers to guard his kitchen alone as he believes in serving dishes from his very own hands. Deemed a perfectionist, Chef Pierre’s vision for Croisette Café is to cook healthy gourmet dishes like he is cooking for his family and to showcase another insight of French comfort food with affordable price. The whole bistro was spacious and decorated with bare essentials and charming French posters. Little adornments in pretty pastel colors brighten up the atmosphere while chalkboard features specials of Croisette. Wines are available while various teas provided much warmness to the drink list. Charming Gerbera daisies added a lovely touch in addition to the greens located around the café. Currently, Croisette Café is running a promotion on Business Set Lunch Menu, served every week from Tuesday to Fridays during lunch hours. 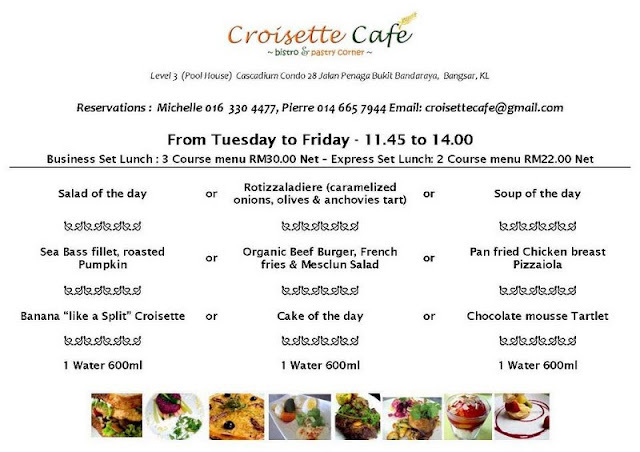 In themed with its healthy, flavorful and value for money, Croisette Café’s Business Set Lunch offers a 3-Course Meal plus a bottle of water priced at RM30nett. 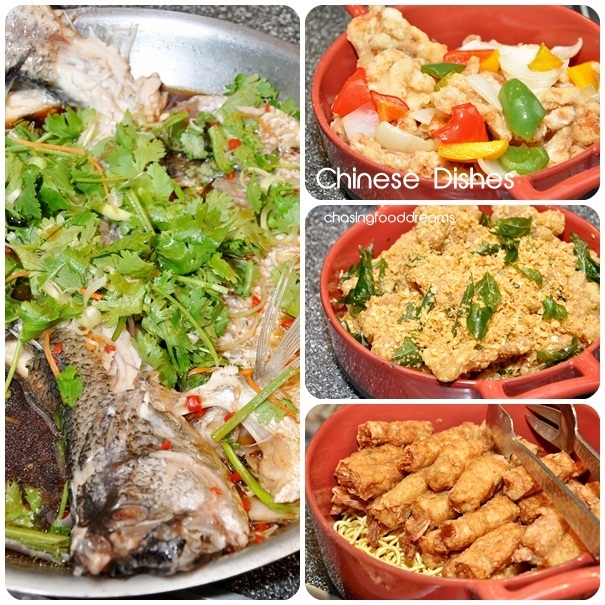 Guests will be spoilt for choice as there are three choices in each course for selection. Menu changes depending on the freshest ingredient available so check their Facebook for the choices each week! Kicking off the first course are healthy options of salads, soups, quiche and Rotizzaladière! Tabouleh may originate from Middle East but the French has given this bright salad a new twist! Made from couscous, assorted vegetables and olives, the Tabouleh salad is simply refreshing with clean citrus and herb flavors. Light and filled with grainy textures, Tabouleh is my kind of salad! Greek Salad with Feta was a garden of colors. Echoing the Greek salad, this one is jazzed up with French feta cheese and olives for a burst of flavors. Lightly dressed to show off the flavors of the vegetables, the salad is extremely pleasant on the eye and refreshing on the palate. I simply heart the Cauliflower Cream Soup! Exquisitely well made, the bisque is delicious with subtle aroma of cauliflower. The bisque had a good balance of creamy flavor and was fairly thick and silky smooth. I wish I could hog this to myself that day! I like how Chef Pierre always gives his French dishes a twist. Another scrumptious creation of Rotizzaladière is the new twist to a French classic of Pissaladière! Using our national favorite roti dough as the base, this pizza look-a-like dish has a classic French topping of caramelized onions, olives, garlic and anchovies. The thin crispy base is heavenly, contrasting with the aromatic smoky onions and salty olives and anchovies. Simple ingredients but outstanding in flavors summed up Rotizzaladière! The French revels in Pâtè! Although some may irk at the thought of savoring poultry livers, I couldn’t be any happier with this creation. House made by Chef Pierre, Duck Liver Pâtè was served with quintessential toast soldiers, pickled pearl onions and gherkins. The pâtè top the first course list with its rich and creamy flavors. Made from duck liver marinated in port wine, the pâtè was surprisingly not too salty but had a good silky finish. A hint of sourness from the baby gherkins and pearl onions cleanse the rich aftertaste of the pâtè. Simply divine!! Turning around the corner into main course, we started off with Duck Patty with Beans. The French obsession with duck is infamous with quite a few French classics showing off the bird’s potential. This recipe is another interpretation of a popular bean Cassoulet where hours of slow-cooked beans are simmered to soft rich casserole and topped with a fried minced duck patty. Truth-be-told, I could not decide which is better, the duck patty or the bean cassoulet! Duck patty has a good bouncy texture with smoky and savory flavors while the beans were creamy and almost nutty. The simple combination of duck and beans were French soul food to my heart. Comforting and satisfying, this dish makes me feel right at home at Croisette Café. Sea Bass Fillets with Leek Fondue showed off the mild and mellow side of Chef Pierre’s recipes. Poached sea bass fillet sits beautifully on melted leeks tinged in golden butter color for the dish. What the flaky and firm fillet lacked in flavor, the leek fondue made up for it. Creamy, buttery and mellow onion taste in the leek fondue stole the show in this dish! A hardworking chef, Chef Pierre believes in making almost everything from scratch! He even smokes his own smoked duck. Hence, the Pasta with Smoked Duck is another delicious masterpiece to look out for in the bistro. Cooked ala Carbonara, the creamy white sauce basically makes the cholesterol level rise up but also renders goodness for the soul once in a while! A bit salty on taste but we were assured that Chef Pierre would go lighter on the seasoning for this pasta. Cheesy and creamy, the pasta was nevertheless absolutely sumptuous in my books and I would definitely reorder this beautiful combination. Duck Breast with Garlic Cream is our third duck dish but I for one could never get bored with duck! It was a unanimous decision that this was the best main course we have tried. Duck breast cooked to pink perfection and sliced, served with Dauphinoise potatoes, greens and garlic cream sauce, the dish represented an epitome of France on a plate. Tender and juicy, the sliced duck went very well with the savory and creamy garlic sauce like a match made in heaven. Potato Dauphinoise showcased sliced melt-in-the-mouth tender potatoes cooked in cream and garlic and gratin to a finished. The French certainly does wonders to potato as well as duck! There is one crucial point that one needs to take into serious consideration before ordering at Croisette Café… Save Tummy Space for DESSERTS!! 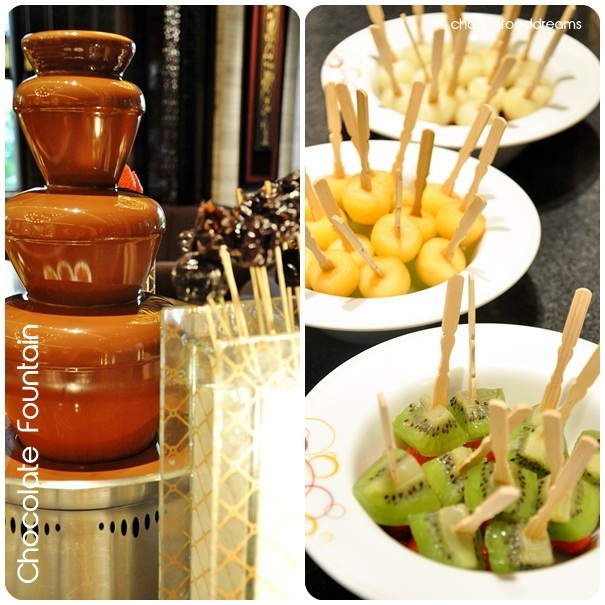 Desserts are simply to-die-for at Croisette Café! All desserts made by Chef Pierre himself hence choosing dessert would be the hardest decision at the bistro. Croisette Café also sells whole cakes upon orders. 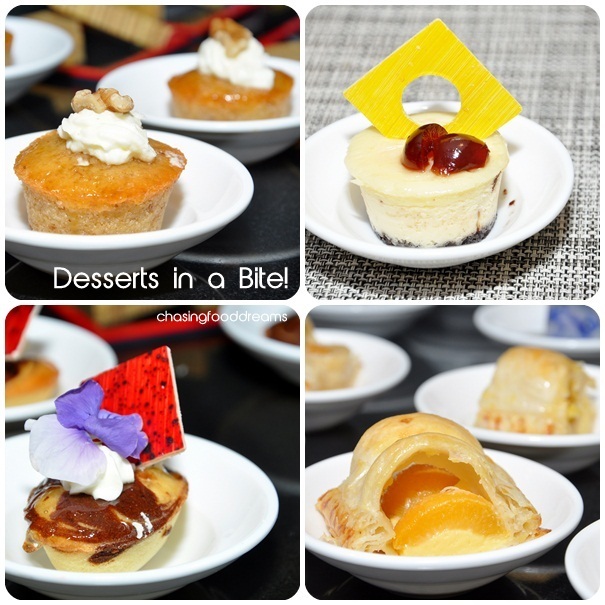 Now let’s check out why I was on Cloud 9 with desserts! Chocolate Banana Pudding is decadently rich in cocoa with pieces of banana. Although not a fan of banana, I didn’t mind enjoying this one as the chocolate flavors are intensely rich and satisfying. Laced with more milk chocolate sauce, the dessert was polished off with gusto by everyone. Another Sable dessert in the form of Sable Duo Mousse and Morello expressed the same satisfaction as the early one. This version featured a chocolatey end with a luscious mousse and a surprised filling of Morello cherry sauce. Hand me a few more of these please! 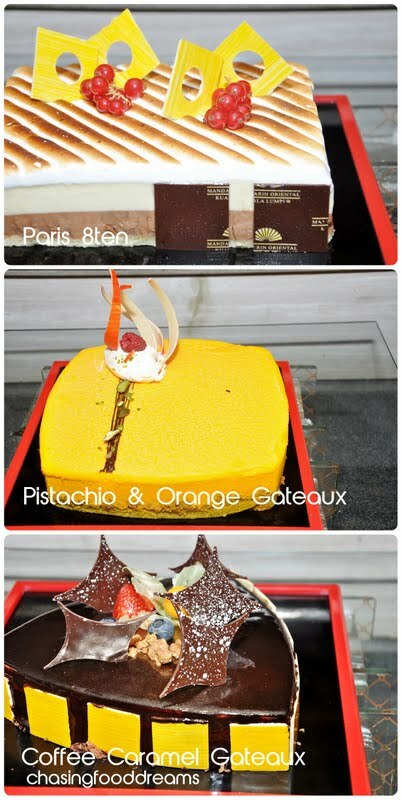 Passion Indulgence is one of their popular mousse cakes. Tangy and refreshing, the layers of mousse and sponge have bright flavors. Served simply with passion fruit and berry sauce, it shines with its name, ignited a moment of sweet and sour passion in every bite of indulgence. I haven’t really had a Peach Melba in years! Almost long forgotten, this classic dessert has vanilla ice cream topped with peaches, berry sauce and toasted almonds. 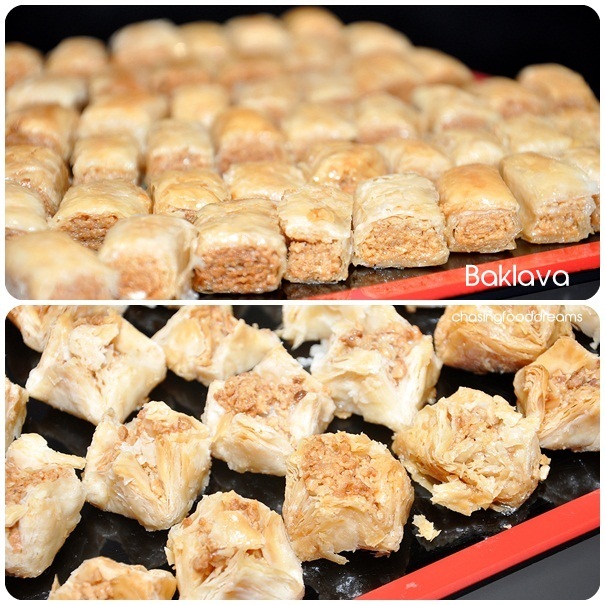 The version here is beautifully done and despite its simple ingredients, we polished this off with great happiness. Croisette Café proved to be more than what I expected. One can expect French comfort fare with very affordable prices, especially in the Bangsar area. Chef Pierre’s focus on single handedly cooks up every dish from appetizer to dessert only adds on his passion for serving healthy gourmet dishes at Croisette Café. With desserts as another plus point, this is the place to bring your loved ones or friends to soaked up a French experience without have to pay an exorbitant price or dressed up in your best frock just to dine at a French restaurant. Croisette Café also does basic catering for take away and one should call up for reservation as there are limited seats at the bistro. Other notable French classics served here are Duck Confit with Potato Sarladaise, Coq au Vin, Beef Bourguignon, Bouillabaisse, and more. Even desserts alone is worthy of a trip here! 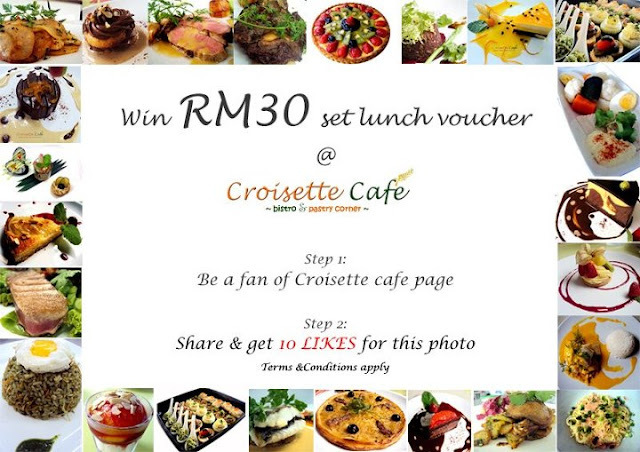 Like Croisette Café’s Facebook and Win a RM30 set lunch voucher! There will be 5 lucky winners every week and the winners will be announced on every Monday in the café’s facebook. All you have to do is be a fan of Croisette Café Page, share the above photo, get new 10 LIKES and you will be short listed as a winner! 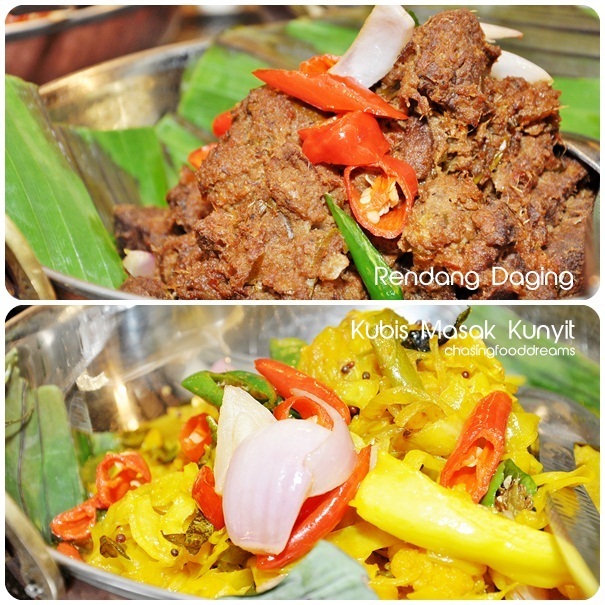 Mosaic, Mandarin Oriental Kuala Lumpur: Revel in a Sumptuous ‘Buka Puasa’ Feast! A Sensual Dining Experience at Mosaic! A time for reflection and spiritual renewal, it is also a time for families and loved ones to gather and feast. As the journey of the holy month of Ramadhan continues, I landed at Mosaic, Mandarin Oriental Kuala Lumpur to revel in its sumptuous ‘Buka Puasa’ feast of authentic local and international favorites of over 100 dishes available from 19th July to 20th August 2012. Mosaic, an award winning restaurant and recently renovated all day dining restaurant, was magnificent at first sight! 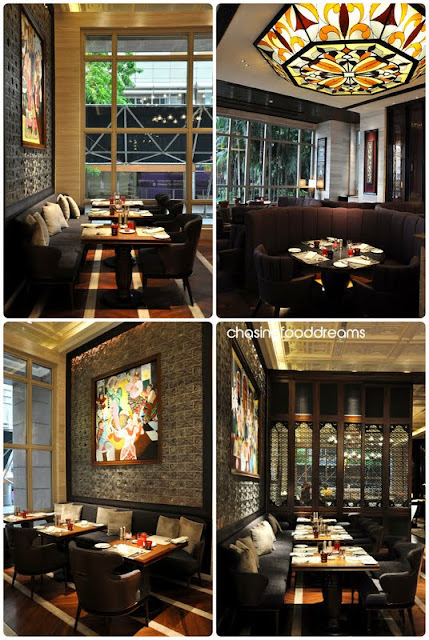 Boasting an elegant ambience echoing modern Peranakan heritage with grandeur, Mosaic features bespoke mosaic walls, prestige chandeliers, intricate pewter hanging lights, various chic live stations among its dark wood and plush furniture. Divided into refined dining sections, the restaurant features two semi private dining rooms suitable for pleasure dining and business lunches and dinners. The restaurant’s signature focus point is the various interactive live cooking stations laden with a vibrant mix of local and international cuisine. 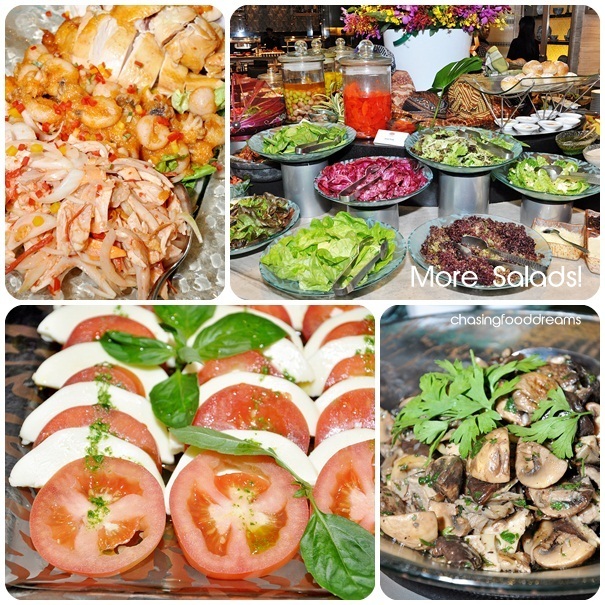 For starters, the appetizer and salad bar is a resplendent centerpiece of mouth-watering flavors! Each dish is served in small portions for freshness and the kaleidoscope of salads, Kerabu, appetizers, sambals and condiments are simply almost mind-boggling in choices. 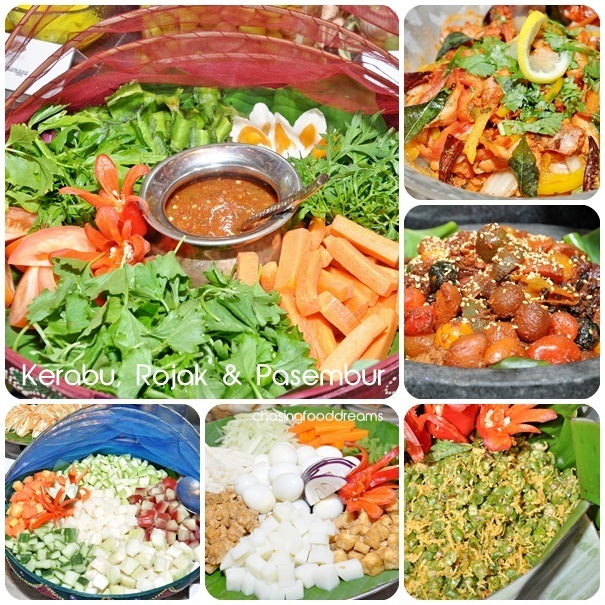 Savor a tradition of Gado-gado, Rojak, Soto Ayam, Ulam Kampung, Tauhu Sumbat and the different types of kerabu dishes such as Kerabu Jantung Pisang, Kerabu Pucuk Paku dengan Taugeh and Kerabu Daun Selom. 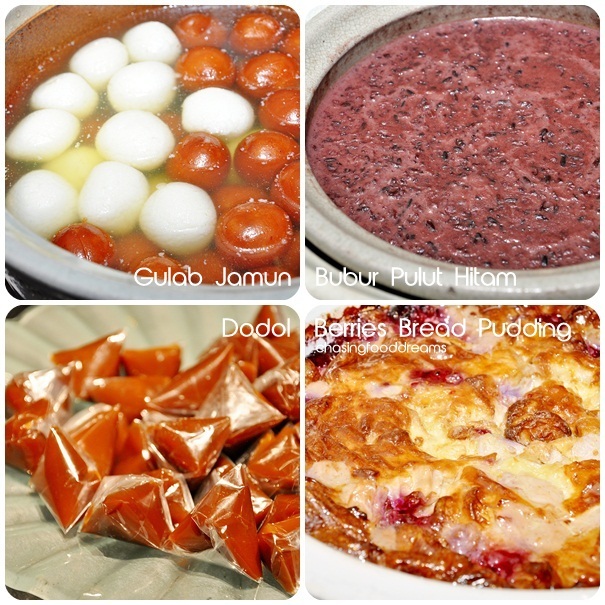 Warm up to a selection of soups such as Sup Tulang Rawan, Sup Kambing dengan Ubi Kentang, Sup Ekoy Lembu and Sup Bebola Ikan or sample the infamous Bubur Lambok, a traditional Malay porridge. There is even international Beef Goulash and more at the soup station. Tummies will certainly be warmed here! 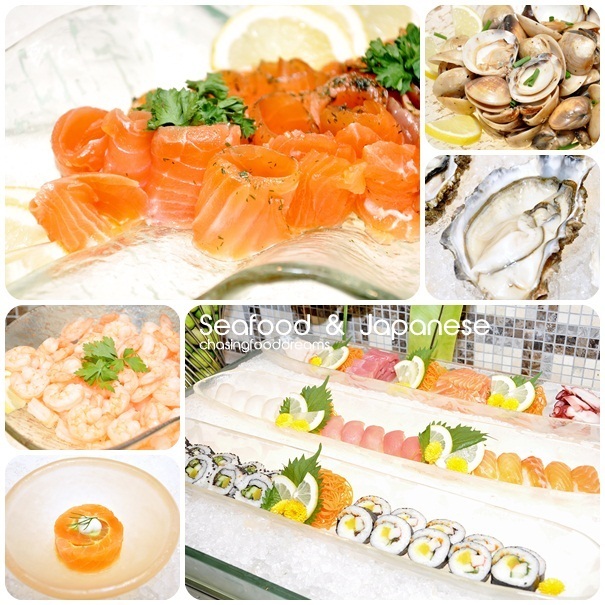 Seafood on Ice and Japanese Sushi and Sashimi is always a favorite! Fresh oceanic oysters to chilled prawns, clams and salmon are a delight while basic array of Sushi and Sashimi provided the much craved raw seafood addiction to diners. For the traditionalist, relish in a variety of main courses in the various Malay, Indian and Chinese live stations. 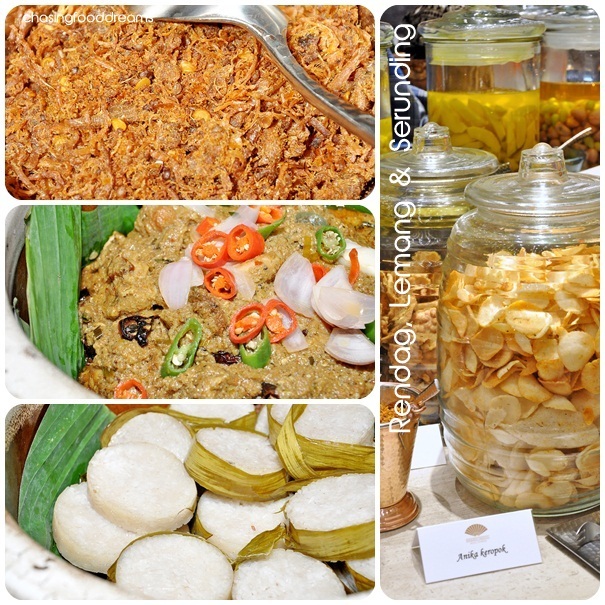 Lemang, Rendang and Keropok together with Jeruk Buah are there to bring back memories of festive moments where tedious efforts are put into festival dishes. 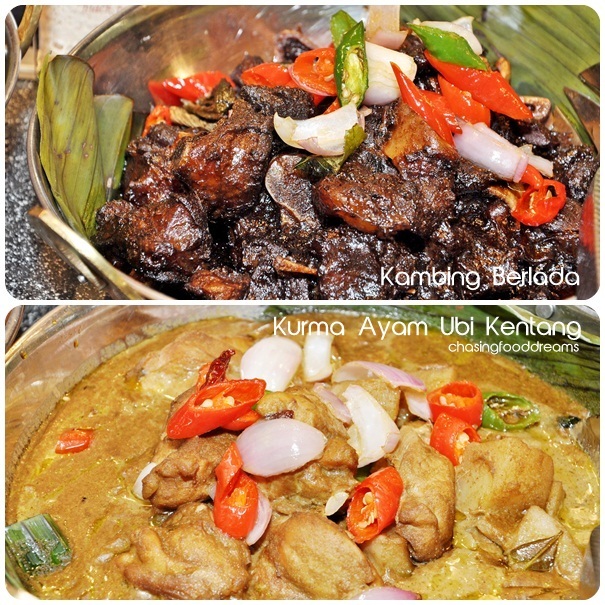 Other main courses featuring an authentic Malay cuisine are the noteworthy Ikan Goreng Ibunda, Ayam Golek Bermadu, Kambing Berlada, Daging Dendeng, Ayam Percik, Kurma Ayam Dengan Ubi Kentang, Rendang Daging, Udang Petai, Lala Lemak Cili Padi and more. Spiced up with the luscious array of refined Indian favorites like the Tandoori Haven featuring Murg Malai Kebab, Tandoori Lamb Chops, Salmon Tandoori, Chicken Tandoori, Kashimiri Lamb Kofta, Chicken Tikka, Kesari Paneer Tikka and more. 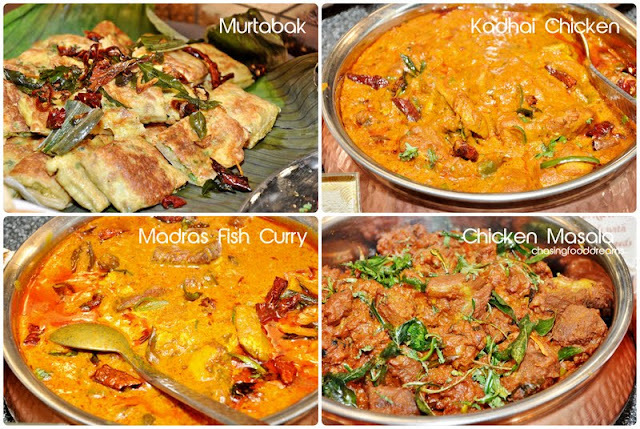 Plenty of flavored Naans and Murtabak are also available to mop up luscious curries such as Madras Fish Curry, Kadhai Chicken, Dhal Terkawali and more. 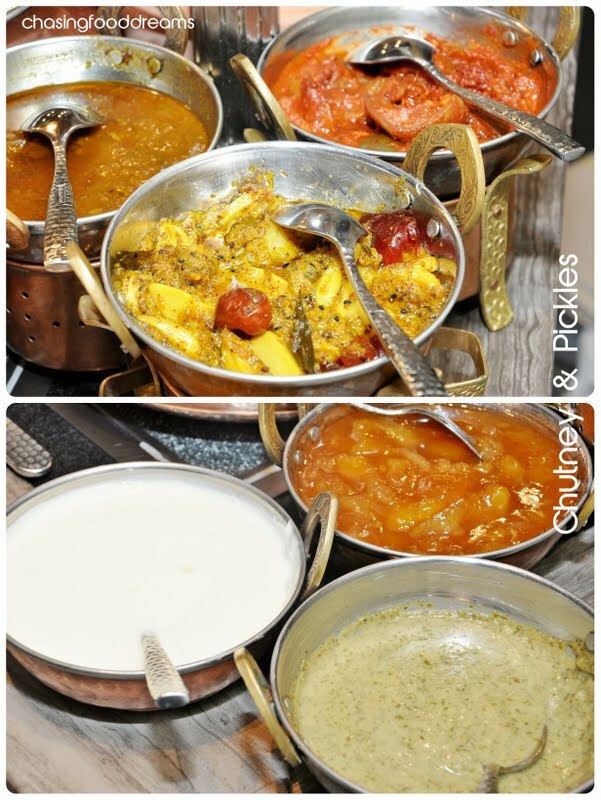 Check out the various spicy and fruit Chutneys, Pickles and Yoghurt to be savored with Briyani as well! Heading over to the Chinese live station, one can indulge in Steamed Seabass in Supreme Soy Sauce, Kung Pao Chicken, Wok Fried Beef with Black Bean Sauce, and lots more. There are also Fried Ee Fu Noodles, Noodle Soup and Curry Noodles for some canoodling! My favorite station of the night would have to be the Roast and Barbeque live station. One gets a carnival of spinning Roast Chickens, meat and seafood in flames while a fun list of condiments are setup for more merriment. Jazz up your palate with marinated Beef and Chicken Skewers, Sausages, Lamb Cutlets, Prawns, Salmon and the list goes on. Satay, Pizza and Roast Beef all vie for attention together with sides. The Italian side has pasta lovers checking out the various pasta offerings from Gnocchi, Spaghetti Bolognese, Penne Carbonara, Pikante to Al-Salmone. High on the delicious list is Roast Beef, fillet of tender and pink beef to be savored with a multitude of sauces and condiments! 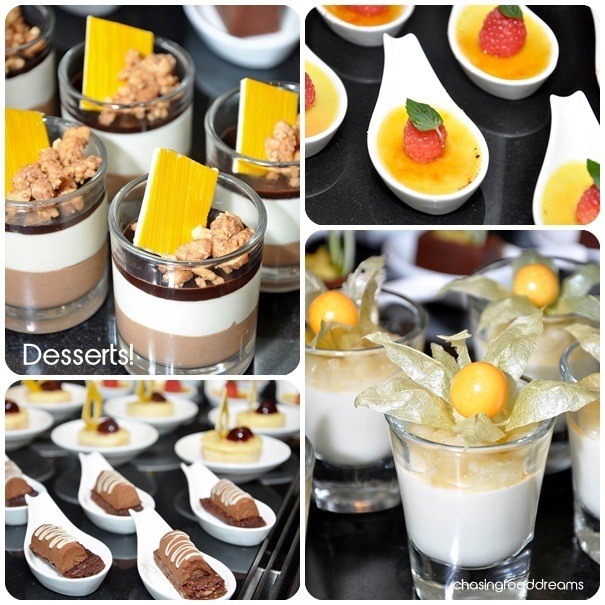 Saving the best for last, Desserts are simply divine at Mosaic! Chef Holger Deh’s creations are fabulously pretty to look at and luscious to savor. Lust up your sweet tooth with miniature decadent desserts or French inspired cakes and mousse to Berries Bread Pudding and Chocolate Fountain with Fruit Skewers. House made Ice Creams and Sorbets, Pannacota, Crème Brulee, Peach Tart, and more are just a glimpse! 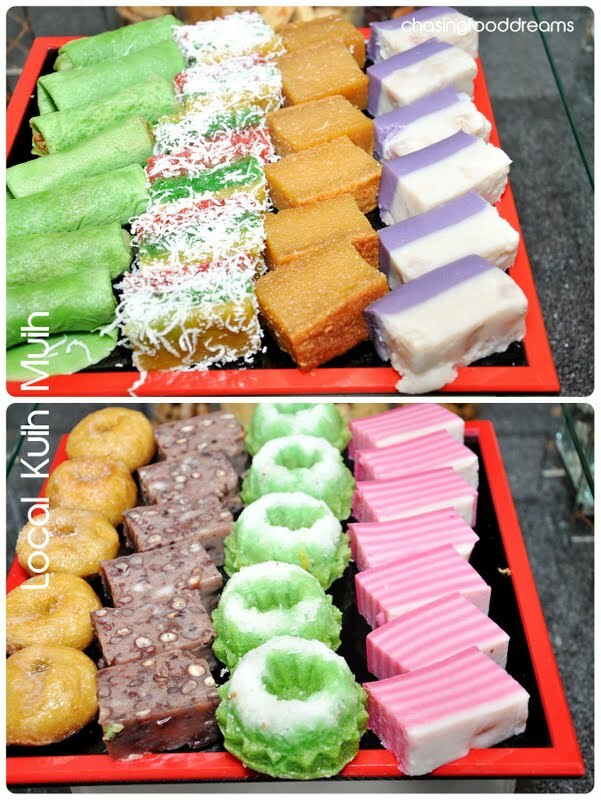 Else savor local desserts of Assorted Kuih Muih, Kurma Dates, Ais Kacang, Chilled Cendol, with Red Bean Bubur Pulut Hitam, Pengat Keledek, Bubur Cha Cha and Fresh Fruits. Wash all these down with a lovely Beverage Bar of Fresh Juices, Soya Bean, Sugar Cane and Teh Tarik to complete the meal! Malay Sous Chef Kamarudin, cooking up a feast of authentic Malay dishes at Mosaic! Mosaic certainly takes the cake in Luxurious! Quality and ambience is top notch while service is always with a smile. Whether you are avoiding the traffic in the bustling city or even making way to Mosaic in the traffic, the feast at Mosaic is definitely drool worthy. 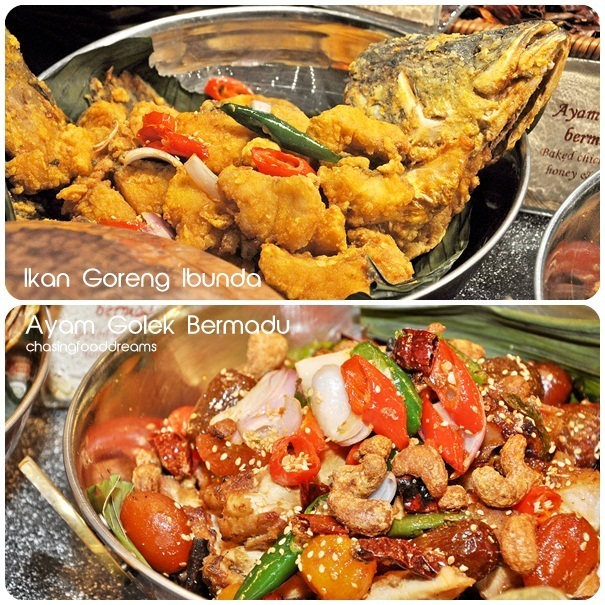 Head on over to Mandarin Oriental for a luxurious feast this Ramadhan to Buka Puasa in style! The Ramadhan Buffet is priced at RM108++ from Sundays to Thursdays and RM128++ or Fridays and Saturdays. For more information and reservations, please call +603 2380 8888 or email mokul-mosaic@mohg.com. The Giraffe, Klang: Riding on the Wild Side!